that does not see you. You must change your life." What Allen began in Interiors and awkwardly attempted in September wills out courageously in Another Woman. While the story is actually much the same as that of the previous year's Alice, here the woman contemplating her life has a maturity that brings greater depth and realization to the concept. In the former, Allen forces his protagonist's epiphany through hypnosis and magic; in this film, a woman is changed by all-too-believable, if serendipitous, circumstance. Marion Post is a well-presented woman who has chosen a masculine life. Relinquishing everything for career and matters of the mind, she is the successful head of philosophy at a prestigious women's college. Beautiful, intelligent and gracious, Marion has the respect of everyone she knows; her choices seem to have gone quite well. Her control over her life—and her emotions—is absolute: nothing touches her. She's happy. On sabbatical, Marion sublets a flat downtown where she can write undisturbed. Settling in, she discovers that through the ventilation system, she can hear the very intimate dialogues emanating from a psychiatrist's office next door. Distracted by the intrusion, she addresses it easily by propping cushions in front of the grate; we learn right away that this is a resourceful woman who is never discomposed. Yet later that day, while she catnaps, one of the pillows slips down and Marion finds herself intrigued by the tearful laments of a young woman; before long, she gives in completely to this voyeuristic impropriety. Although this wretched, unseen woman is real, there is little doubt that we are meant to understand her to represent Marion's own repressed emotions. As the story progresses, Marion encounters people and events that begin to dismantle her self-perception and expose her to herself. Another Woman is a noble undertaking for a master dialogue comic. 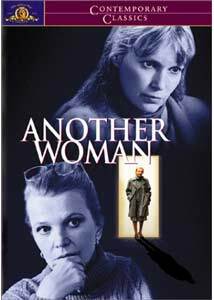 A sensitive film about an insensitive woman, the tone is ironic and humorless, but never dreary. The dramatic devices Allen chooses to deliver revelations—simultaneously to his character and the viewer—are brilliantly conceived through Marion's self-narrative, the overheard plaints of a third party and a few well-placed memory flashbacks. Perhaps the film's most significant expedient is the director's impeccable casting: there are lengthy scenes in which only the lead character appears but does not speak or interact, and there are too few actors who could carry the screen in such circumstances. Gena Rowlands is this film, and she is as stunning here as in her Oscar®-nominated performance in husband John Cassavates' A Woman Under the Influence, the polar opposite of this contained and distanced woman. Her distraction becomes ours, her contemplations and reflections spark our own introspections so that we are not simply complicit voyeurs, but participants as well. The supporting ensemble is the usual who's who of accomplished actors willing to work within Allen's spartan budget, although other than Farow, they are all first-timers. Gene Hackman earns his keep as the one character at peace with his emotions, and John Houseman, in his final performance, is a painful shadow of his once imposing figure. Everyone, as ever, seems to give their best for Woody. Another Woman, like Deconstructing Harry and the previously mentioned Alice, draws somewhat shamelessly from Ingmar Bergman's Wild Strawberries (Smultronstället), but here Allen finally succeeds in creating a dramatic honesty that is truly his own. His persona has never been so completely absent from a film bearing his double stamp, and while this may alienate some, it is a joyous release for this reviewer to realize the success of it. Bravo, Woody. Image Transfer Review: Mostly bathed in solemn amber, this last of five discs in the second Woody Allen Collection displays the fine treatment with which MGM has grace this entire set. There is a bit of unsteadiness in the pattern on the vent, and I noted at least one piece of dirt in an early scene, but it is otherwise flawless. With natural fleshtones, superb color and a soft evenness throughout, this release is a fine example for anyone who "forgives" films based on age from the 1980s, as if they were senior citizens that need our pity. This is as lovely as it was in the theaters, if not better. And, by the way, who says they don't wear brown in New York? Audio Transfer Review: Allen's musical choices are, as always, as impeccable as his casting, and likewise always as important. The score is perfectly placed and never intrusive. Gena Rowlands' voice has an unstudied quality that stands out in her interior monologues that is completely natural and clear at all times. It is interesting to note that as the voices become present to Marion, we react similarly: Is that a voice? What am I hearing? Very well done. French and Spanish tracks are provided as well, and are equally sufficient. Extras Review: French and Spanish subtitles are provided in white with black outlines and appear within the image area. Again, I implore MGM to include English subtitles for us soon. The original trailer is in 1.85:1 and is as clean as the feature. The standard single-fold booklet with production notes is included. Another Woman is not just another engaging film from Woody Allen, but a meticulously constructed drama—from Woody Allen. While not for everyone, once you settle in, you'll be mesmerized. With the unusually subtle power of Gena Rowlands gracing every scene, this is the laughless movie we knew he could make. Recommended.